GoGreen_02aug09_GGGC_CR - GGI-Group size: 4000+ Professionals, Increasing on day to day basis, Come & join us 2 serve Mother Nature. Jaynagar 4th Block - Jnagar 3rd block - Mahadevan Park - Ashoka pillar - Lalbagh West gate - Minerva Circle - Hudson Circle - Cubbon Park - City Libarary - Bangalore Press Club. Malya Hospital, hotel Ramanashree - Residencey Rd flyover - doubel road -Lalbagh Main gate - Lalbagh rear Gate - Ashoka Pillar - Swiming Pool road - Jaynagar 4th block - KFC - Jaynagar 5th Blk Cofee day/ Apple Mac show room. 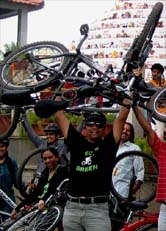 A gentleman by name Ashok Bajaj driving REVA stopped and was quite impressed to here about our Cycling activities, He liked the Go Green T-Shirt, opted for it and also wanted to join us from the next weeks event. 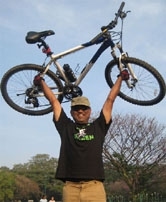 Like wise we meet 3 other members who would were interested to join our group and help us in promoting Cycling. 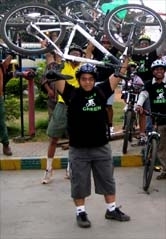 All in all our message of Go Green is going to all our Bangaloreans and have a very positive feedback. Thanks for all our team mates who r making this a big success!! Snap shots of campaign ride.